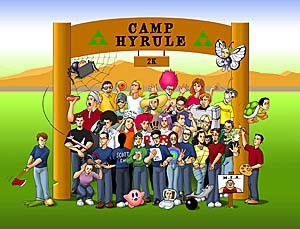 This years Camp Hyrule was held between August 07-11, 2000. Ahhhh... Now, how should I start? This year R-U-L-E-D. Especially over last year. This year we had no fear for the Invalid Logins, because they were a thing of the past.. (Maybe Scott decided to check things ahead of time to make sure.) This was probably the best camp I have been at, this making it my 4th year at camp. Every year is something special, but this year .. I don't know. It was great, even though this year I couldn't get on as much due to work. Let's hope next years camp runs pretty much as smoothly as this years did. This years camp had a variety of different activities to do. The classical "Face Painting" remained. Some other activities included Box Art Challenge (Majora's Mask), Canoe Trip, Trophy Design, Mario Golf Tournament, Loft Monster Hunt, Trophy Search, Make a Profile for NOAMike, Prof. Oak's Challenge, and Prof. Elm's Challenge. Prof. Oak's Challenge consisted of you finding one Pokémon that day and doing the puzzle that went with it. Prof. Elm's Challenge was to find a new Pokémon hidden among camp. There were 4 new Pokémon introduced in this way. Some of the places that existed this year to chit chat with your friends were the following: Bonfire, Cabin 1-20, The Moon (after it crashed), Half Pipe, NOAHQ, Romani Ranch, Pokémon Stadium, Battle Zone, Lake, Sunken Ship, Diving Platform, Sulfur Drain, Clubhouse, Tennis Court, Green, and Kirby's Messhall. Well, there's not much else to say about camp other than it ruled ALL. It could not have been better, especially to make up for last years camp. There were new NOAs... new chatters.... and new activities, but it's the same camp. Nothing could get better than CH2K. End Of Camp Awards: These winners will receive a poster autographed by the NOAs on the back. Mario Golf Tournaments: The daily winners receive a poster autographed on the back by the NOAs. The week long winner receives a "Mario Tennis" game pack!